Last night there was a memorial service for Craig Noel at the Spreckels Organ Pavilion in Balboa Park, and at the Copley Plaza, in front of the Old Globe Theater. We celebrated the life and friendship of a great man. Many of his friends were in attendance. I took very few pictures because I feel odd shooting at the memorial of someone I consider a friend. 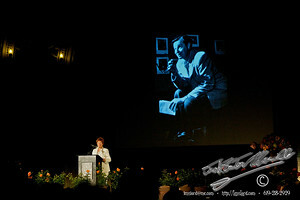 This image is of Marion Ross telling heart warming stories of her time with Craig over the years. One of those stories was about the production of “Summer in Smoke.” That is why I chose this image of Marion. I worked on that show.